Maintenance kit with fuser core exchange. 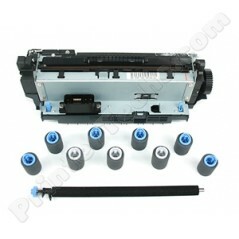 PrinterTechs Long Life remanufactured fuser, HP M601, M602, M603. Maintenance kit with fuser core exchange. PrinterTechs NEW fuser, HP M601, M602, M603. Maintenance kit, no fuser core exchange. PrinterTechs NEW fuser, HP M601, M602, M603. PrinterTechs is proud to introduce our Long Life M601 M602 M603 series fusers. We have tested our Long Life fusers to over 500,000 pages, try doing that with a competitors' fuser! That's double the life expectancy of a new Genuine HP fuser. We have two types of fusers: the Long Life remanufactured fusers and the new fusers (standard life, rated at 225,000 pages). Our Long Life remanufactured fusers are remanufactured by us, right here in Middleton, WI --- not Mexico or China, like many of our competitors' fusers. We control the quality by using our own experienced technicians and our own long life parts. If you are a service company utilizing the cost-per-print model or managed print, give us a call. Our fusers and maintenance kits will save you on service calls and maintenance costs because of their reliability and longevity.